You're getting intermittent issues with your device, so you suspect there's contamination in the electrical contacts. Dust, dirt, grease, and oxidation contamination can increase electrical resistance in contact areas. That means the current flow is potentially reduced or interrupted, affecting the performance of the device and potentially leading to safety hazards (i.e. areas with high resistance can start to heat up). It's our first instinct is to open up the control panel, junction box, or wherever you have contaminated contacts, and spray it down with your trusty contact cleaner. 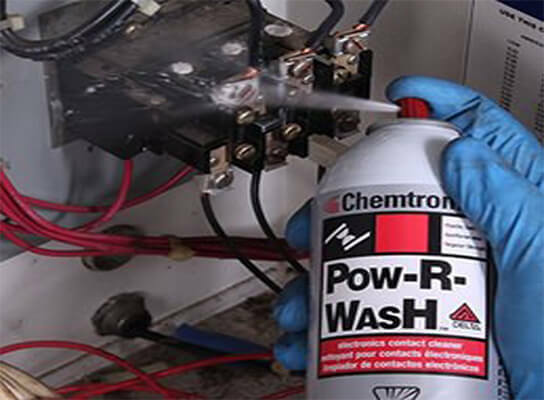 A contact cleaner is a solvent cleaner designed to remove contamination from electrical contacts. 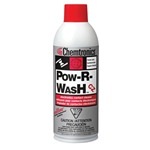 Chemtronics offers a large selection of aerosol electrical contact cleaners under the Pow-R-Wash™ brand. BEFORE you start spraying, we strongly recommend you shut down power to avoid the potential of sparks, electrical shorts, and other safety hazards. But what if, for whatever reason, you don’t have the option of disconnecting the power. Is it Possible to Safely Clean Energized Connections? There is no way to give a definite answer for all circumstances, because safety is highly dependent on the amount voltage and amperage as well as environmental factors such as the equipment, working environment, etc. On the other hand, choosing a contact cleaner with high dielectric strength or breakdown (also called withstand) voltage increases safety when you do have to clean energized equipment. Dielectric strength is defined in terms of the insulating material, as the maximum electric field that the material can withstand under ideal conditions without breaking down. Breaking down in this sense is described as a failure of insulating properties. The electricity breaks free of the conductors and burns a path through the weakest area of the insulating materials. And, it’s not a breakdown over time. As soon as there is enough free electricity it will immediately or, in a nanosecond, discharge through the insulating material. If it doesn’t discharge through, it’s going to severely degrade it to the point it is of no insulating use. So you want a cleaner with high dielectric strength because you want it to clean without conducting. You want it to act as an insulator to protect you while you are using it. It seems basic, but it should clean an energized surface, not conduct electricity back to you or to your insulating material and it should not corrupt or attack the circuit you are cleaning. When selecting a contact cleaner, look for dielectric strength in the product specifications. The higher the number the better, and you want to avoid spraying energized contacts with anything below 30 kV. You want a cleaner that dries rapidly and suppresses electrical arc and corona. 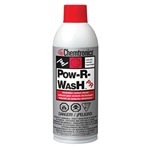 Chemtronics Pow-R-Wash™ contact cleaners, as an added benefit, have all-way spray. This provides the option to turn the can as needed when spraying, so you are able to clean even confined or awkwardly spaced areas without spraying propellant instead of solvent. Generally, spraying propellant won’t do much more than super-chill the area you are spraying. But if you use a low-cost consumer-grade contact cleaner, such as those found in a hardware or auto parts stores, you need to be particularly careful. Many of those products use propellants like propane and butane – yes, the same material used by your gas grill or lighter. 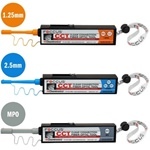 As we said before, there are no guarantees when the electricity is on, but the contact cleaners Chemtronics offers have a variety of dielectric breakdown strengths and they are rated on our website in terms of dielectric strength, cleaning strength and nonflammable properties. Our products are non-ozone depleting making them safer for the environment. They remove grease and grime but are non-corrosive, and most are very safe for plastic components and rubber seals. Our DPL cleaner/lubricant will displace moisture and inhibit corrosion on electrical and electronic conductors and surfaces. 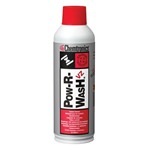 And if you’ve got a dirty job and really need an aggressive cleaner that is still nonflammable then the Pow-R-Wash Delta is what you need. Our technical assistance staff will be happy to discuss the products with you and answer any of our concerns or technical questions. Check out the Chemtronics contact cleaner selection guide. We’ll even send you a sample if you want! VERIZANE™ Cleaning Chemistry (VZ) - Chemtronics’ most economical line of ozone safe cleaning solutions.